The 2008 model Lamborghini Murcielago LP640-4. 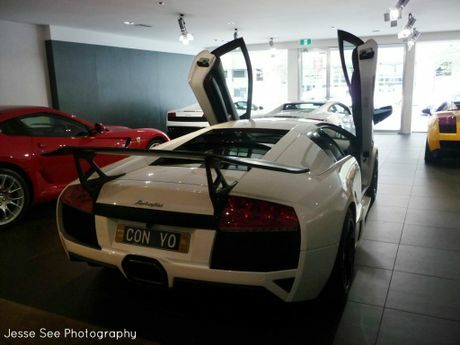 THIS is an immaculate 2008 Lamborghini Murcielago LP640-4 that is for sale at Lamborghini Brisbane. This version of the Murcielago is equipped with a 6.5-litre, 48 valve V12 engine which can produce up to 471 kilowatts (640 horsepower) at 8000rpm and 660 Newton metres of torque (487 pound-feet of torque) at 6000 rpm. All that power runs through a six-speed automated manual transmission, with shifting paddles behind the steering wheel, which then sends all the power to all four wheels, in classic Lamborghini tradition. In the name of this Lambo, the LP stands for Longitudinale Posteriore, which is the engine position, the 640 stands for the PS (German for horsepower) and the four represents the four-wheel drive. It also has a kerb weight of 1690 kilograms. This allows the Murcielago LP640 to launch from 0-100kmh in just 3.4 seconds, and it will keep accelerating until it reaches its top speed of 330kmh (205 miles per hour). This particular model also has Lambo doors, and this was invented by Valentino Balboni, Lamborghini's former chief test driver, to improve visibility when reversing. To do this, you sit on the side of the doorsill, and simply reverse the car with your door open looking where you are going outside the car. It was first used on the Countach, and it has been passed on through the Diablo, Murcielago, Reventon and it has found itself on Lamborghini's newest model, the Aventador. Some other features that this particular 2008 Lamborghini is equipped with includes a beautiful Bianco Isis paint scheme, 18-inch, five-spoke black alloy wheels wrapped in performance tyres, variable intermittent wipers, front, centre and rear limited slip differentials, double-wishbone front and rear suspension, a front and rear stabiliser bar, four-wheel ABS as well as traction control, self-levelling xenon high intensity discharge headlights, front and rear carbon ceramic brakes, seat-belt pre-tensioners, electronic brake force distribution, a leather interior with sport front seats and much more. Also be sure to stay tuned next week to see the successor to this Murcielago. The 2008 Lamborghini Murcielago LP640-4.